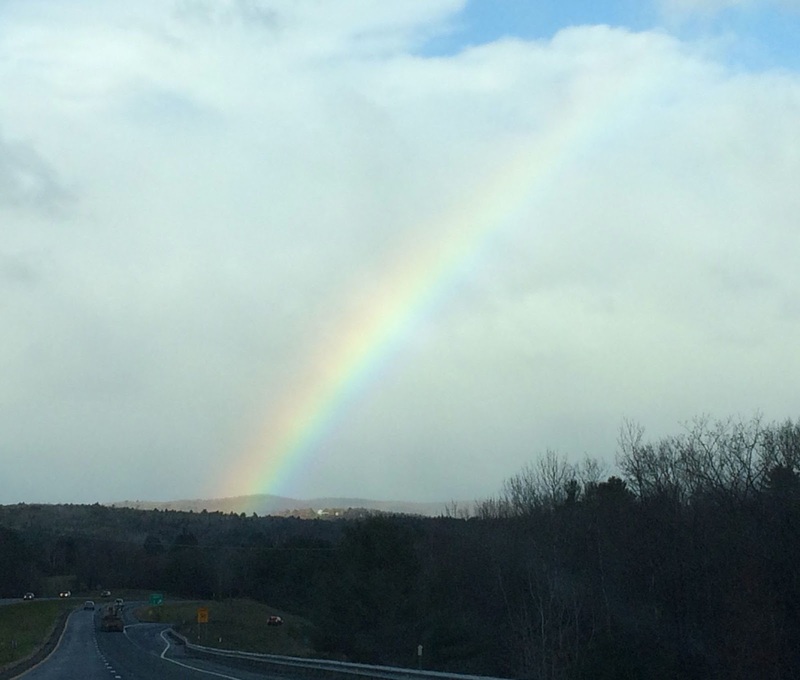 We followed this rainbow to the Lie-Nielsen event at Shackleton Thomas. 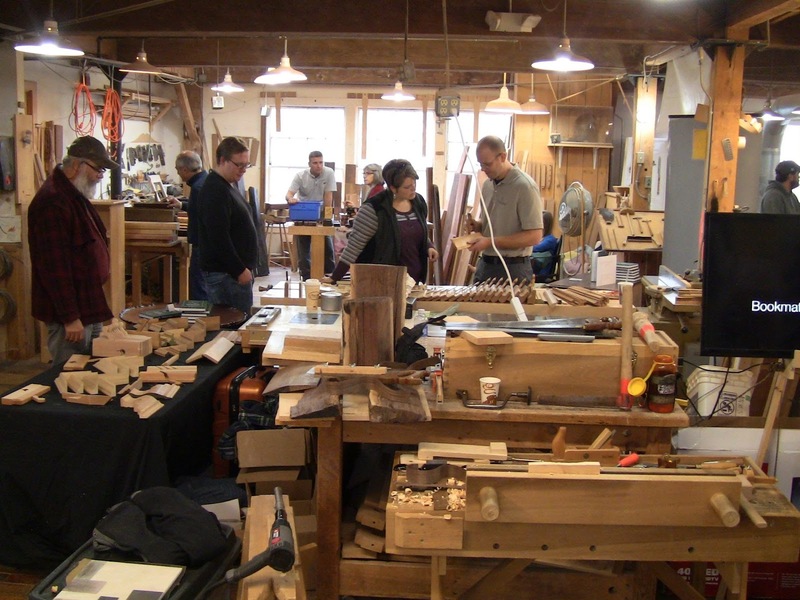 Last weekend was an excellent Lie-Nielsen Hand Tool Event at Shackleton Thomas in Bridgewater, VT. This was a new venue for the event. Shackleton Thomas makes high end hand-made furniture and pottery. Much of the furniture is in a clean, crisp style reminiscent of the Shakers, with additional decorative elements. Stopped chamfers abound. 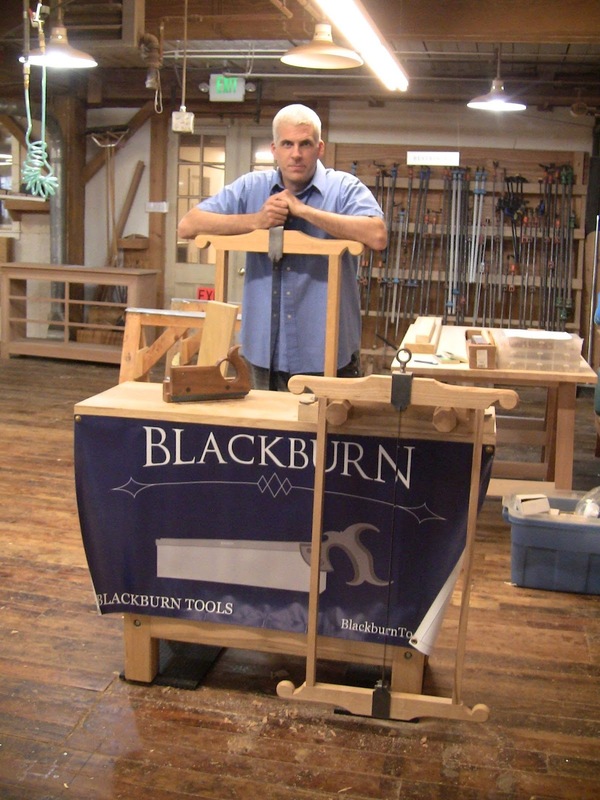 Growing up in Ireland, co-owner Charles Shackleton was trained in traditional methods in Surrey, England. His wife Miranda Thomas is a renowned potter who trained in Farnham, England. I wondered about the name. Then I saw a calendar on the wall with a photo of Tom Crean. When I met Miranda setting out some cookies, I asked if he was that Shackleton. Indeed, Charles is a cousin of Ernest Shackleton, leader of the first expedition to reach the South Pole. Charles and his brother have also been there. How's that for a family tradition? The Shackleton Thomas workshops are in an old wooden mill building along the river in Bridgewater. The woodshop is on the second floor, with multiple large windows on three sides. That makes it a very comfortable, open space among the heavy timber beams. Each piece of furniture is made by an individual craftsperson. In addition to the employees, they also have an apprenticeship program. This would be an awesome place to develop into a furniture maker. There was a pretty steady crowd both days. 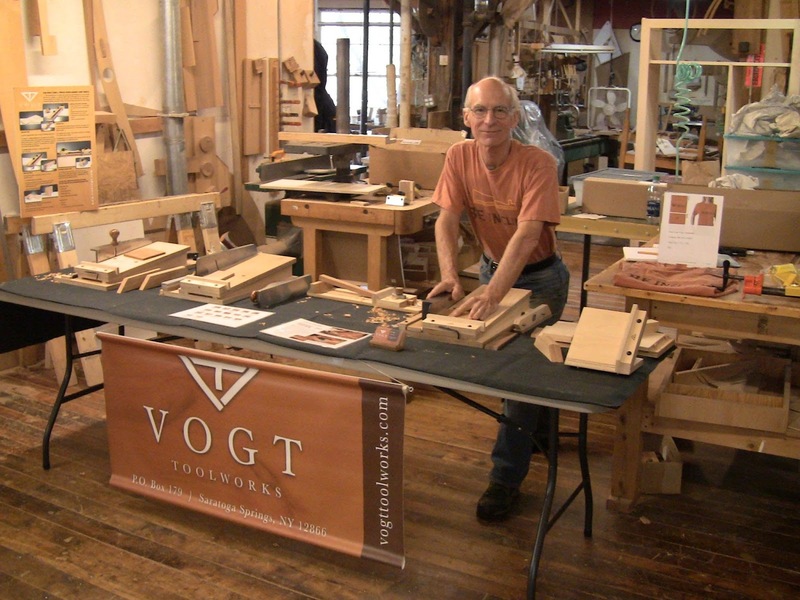 Charles is a member of the Guild Of Vermont Furniture Makers, and there are several other woodworking organizations in the area. In addition to locals, I talked to people from Montreal, New York, and Connecticut. The Vermont Standard has a nice photo gallery of the event. 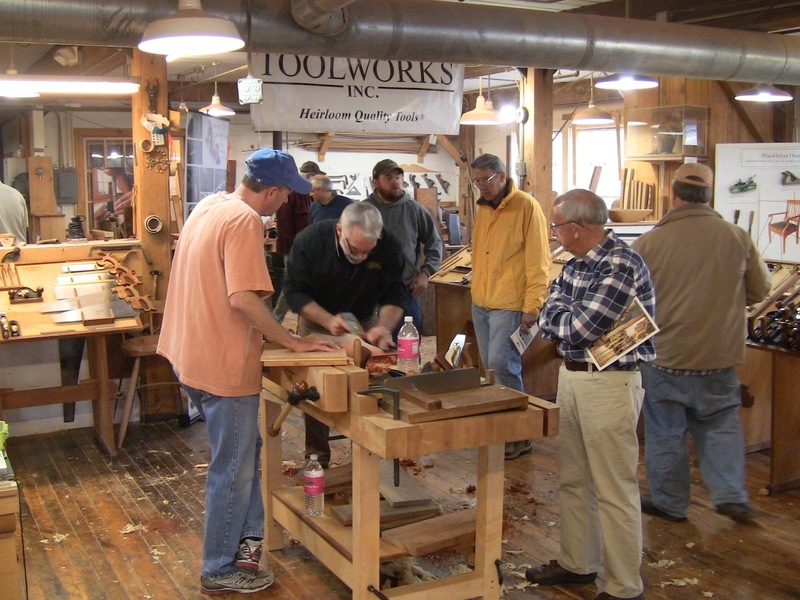 I'm the guy in the maroon shirt with the Society of American Period Furniture Makers logo. Deneb Puchalski demonstrating a plane. David Yepez demonstrating some chisel work. In addition to the LN staff, there was Tico Vogt with his Super Chute shooting boards and a new magnetic fence for drill press and bandsaw, Isaac Smith with his Blackburn Tools framesaws and backsaws, Matt Bickford with his wooden moulding planes and spectacular book "Mouldings In Practice", and Travis Knapp with a supply of exotic woods. I picked up a nice supply of quartersawn steamed beech from Travis so I can finally try making my own planes. Matt Bickford showing someone one of his wooden moulding planes. Travis Knapp is in back in front of the window. Isaac Smith with his saws. Tico Vogt demonstrating his Super Chute board. I was promoting my Popular Woodworking University online video course Intro To Hand Tools. I also had my current assortment of items for practicing the skills involved in violin-making. That made a nice combination. For the people who were interested in learning hand tools, I gave impromptu lessons on several basic skills, encouraging them to take the tools in hand and try them out. For others, I went over my process for riving out stock, forming and shaping violin body plates, sawing out veneers for sides, and bending them on a heat-gun-powered bending iron. One family I talked to was there with their teenage son. 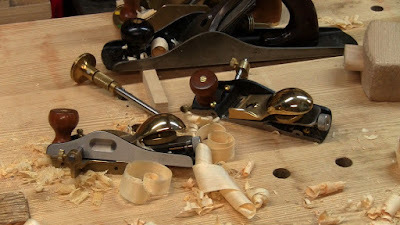 His mother said the course might make a good class for his home schooling, so I showed him how to remove 1/16" shavings with my meat-eater wooden jack plane, then had him try out the LN Boggs spokeshave. Since I had my Society Of American Period Furniture Makers shirt on, I talked to several people about SAPFM. One lady was an instructor at a nearby woodworking school who was there with some of her students. She said a several people had expressed interest in making period furniture, so perhaps there might be an opportunity to form a new chapter in that area. 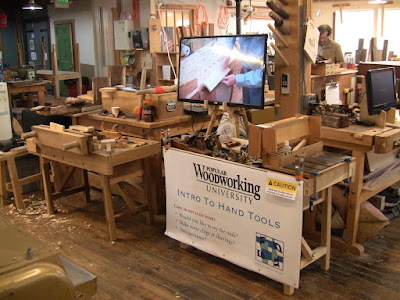 My workbenches, new banner, and silent video trailer with scenes from the course running on the flat screen TV. One tool I ended up talking about a lot was the LN skew block plane. This has become my new favorite plane. I had originally bought both right- and left-handed versions a couple years ago for panel-raising, but just had the right-handed one with me. A still shot from my course segment on panel raising showing the skew block planes. It's incredibly versatile. The secret is the combination of very low bedding angle with the skewed iron, along with the removable side and built-in fence. With the side attached and fence removed, it functions as a regular block plane. With the side removed and the fence installed, it can rabbet along or across the grain, chamfer, form panel edges, or even plane end grain directly. The low angle and skew of the iron are able to deal with any grain orientation. And by rotating the workpiece from flat on the bench to up on edge, the single right-handed plane can cover both right- and left-side chamfers. 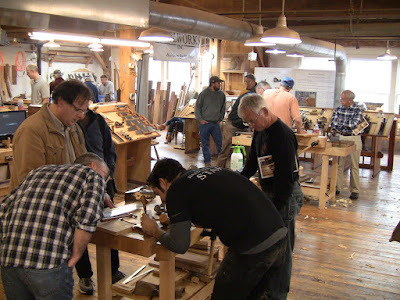 It was great fun having people try out all the different orientations and seeing their amazement at the beautiful shavings produced, from long flowing edge rabbet ribbons and spiraling cross grain chamfer spills to the amazing pencil-sharpener end-grain ribbons. This plane was pure joy to use. I'll have to do a full-blown blog post on it. After the event, Miranda invited us all to select a coffee mug from the showroom. Thank you, Miranda! 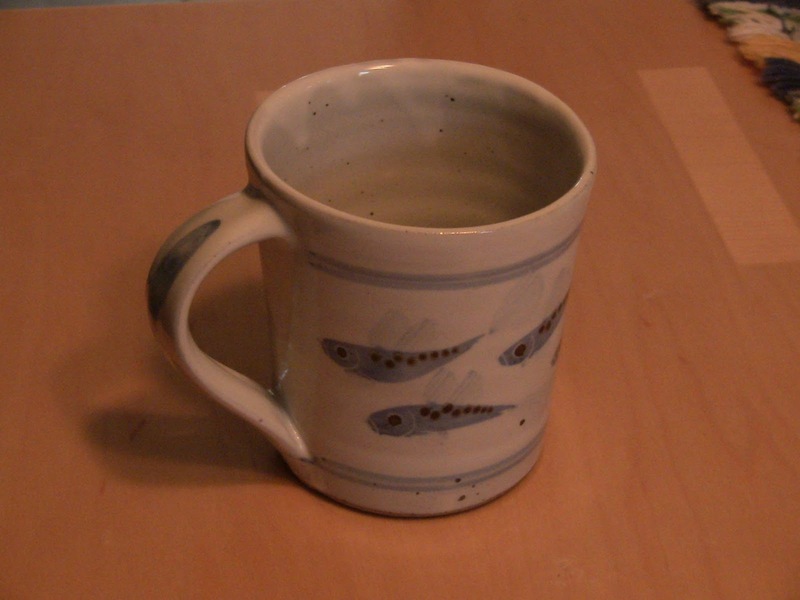 I liked the fish motif on this mug. 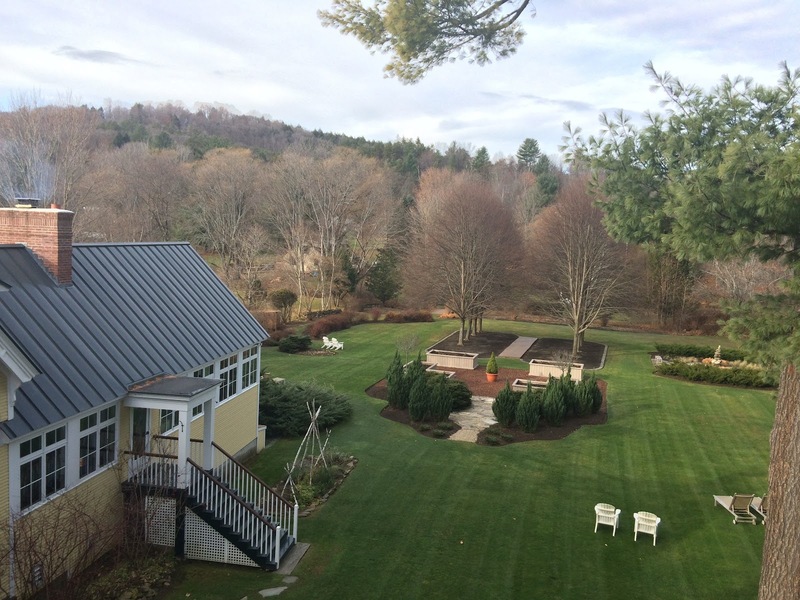 Since Sunday was my 55th birthday and 32nd wedding anniversary, my wife and I made a long weekend out of it, a lovely late autumn Vermont getaway. This is ski country, so the seasonal patterns we're used to with Cape Code and downeast Maine are reversed. There, places close down at the beginning of November, after the end of leaf season. Here, many places don't even open until the end of November. This was the quiet time, after all the leaves have fallen, before the snows have started. But there's something going on all year in this beautiful area that follows the cycles of nature, with maple sugaring season bridging the end of winter into spring. We stayed at the wonderful antique-filled Jackson House Inn bed and breakfast, owned by Rick and Kathy Terwelp just down the road in Woodstock. The dining room is full of Shackleton Thomas furniture. Our view from the back balcony. Late Fall, bare trees! First course of Rick's Sunday morning breakfast, an apple concoction with homemade caramel (foamed caramel on the right side). Oh yeah, this was good! Rick is the breakfast chef. He's an artist as skilled as the craftspeople at Shackleton Thomas. 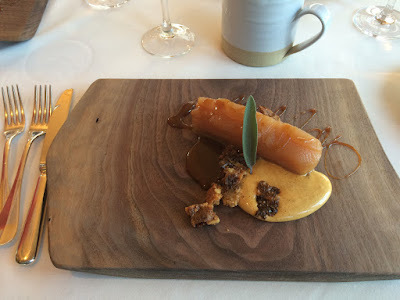 Both of our breakfasts were exquisite creations, composed entirely of local ingredients. This is a very self-sufficient area. Rick used fruit from local orchards, vegetables and meats from local farms, breads from local mills and bakeries, and cheeses from local dairies. Even the maple bourbon in the sauces were locally made. We're looking forward to repeating this event next year! Congrats on 32 years together. Congrats on the birthday and anniversary, It looks like a picture perfect weekend.